Australia’s most reliable brand of petrol and diesel powered water pumps. 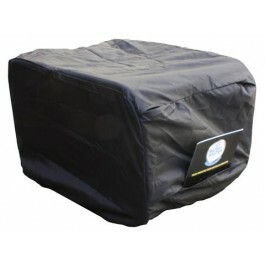 Water Master Small Pump Cover Keep your pump protected with a new dust cover, including a handy pocket. Also features a drawstring to ensure a tight fit, and access holes to allow handling and securing directly to the frame. Product is currently 'In Stock' and usually dispatched within 1-2 business days. Item will be dispatched from the closest 'stock warehouse' to the delivery address. This product is sent via a road express courier service. We send goods with national freight carriers like TNT, Toll & Star Track Express. Estimated delivery time for Sydney, Melbourne, Brisbane is typically 2-3 business days. For other cities, allow 3-5 business days. For remote or rural locations delivery times can vary from 3-7 days depending location. NOTE: items are fully insured during the freight process. Wanted to update the Fire Fighter pump I had been using to transfer water. This Water Master is rugged, was easy to install and pumps quicker than the Davey Fire Fighter pump. Everything went smoothly: from researching appropriate product, to using online ordering and payment system and to the subsequent timely delivery of my purchase. Genuine Honda 2" Water Transfer Pump, by Water Master. 2 Year Warranty. The MH20-2 is a petrol powered, 2″ Water Transfer Pump. It is driven by the legendary reliability and performance of a 4.8hp Honda GX engine. The pump end housing, fittings and impeller are all made from high quality cast-aluminium. This model weighs only 25 kg, making it extremely convenient to move around a property or in and out of vehicles. Perfect for high flow water transfer, tank filling, dewatering and irrigation. This model supersedes the MH20 model. With a 2 inch suction and discharge size, this pump offers heads to 32 metres and flows up to 610 L/min. Great for high volume water transfer, fast fill tanker requirements, flooding irrigation and dewatering of construction/building sites. This versatile and easy to start water pump comes backed by a national established service network and complete with a 2 year warranty. Q:Is there a way to know the PSI water pressure a water pump will deliver? Hi Ken, thanks for your question. Yes there is; approximately 1 metre of max head is equal to 1.42 PSI. So you can simply multiply the maximum head of the pump by 1.42 to give you the max psi rating of that pump. For example, if a pump has a maximum head of 40 metres, then its max pressure is approx. 57 PSI. For reference, a typical garden hose dispenses water at about 30-40PSI. 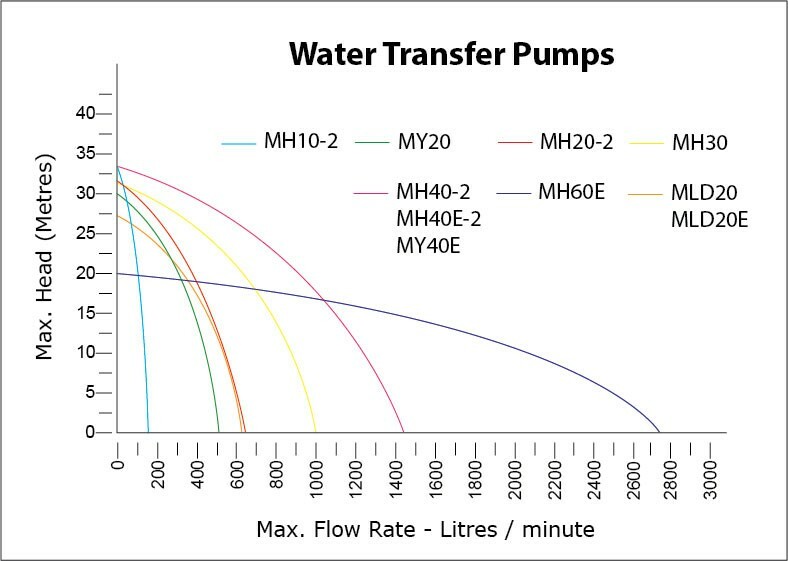 Generally speaking, Transfer Pumps will have lower PSI capacity, but can move larger volumes of water, whereas High Pressure Fire Fighting Pumps will have a higher PSI but move lower water volumes on a litres per minute measure. Hope that helps, thanks - Steve. Q:Is it okay to fit a smaller sized hose to the pump output size? If so, that would probably increase the PSI a bit more as well?...or do I have to match both input and output with the same size hose? Hi Mark, it is always recommended that you use the same diameter hose/piping as the suction and discharge ports on the pump. While it is sometimes necessary to reduce that diameter, it is strongly advised that you do not reduce the hose size by more than half an inch. While you may see an increased pressure due to the slightly smaller piping, this will also see an increased backpressure on the pump. The more you reduce the hose/piping diameter, the more you increase this backpressure and likely cause the pump to fail and that would not be covered under warranty. Hi Kym - the answer is absolutely yes. These are genuine Honda engines, from Honda Australia. For any servicing or warranty requirements, you can take the engine to any approved Honda service agent around the country, of which there are over 400. We are aware of some cheaper power equipment brands using imitation Honda engines or engines not supplied by Honda Australia, but we do not stock these brands. All our products are from brands using legitimate componentry and are backed by extensive warranties and national service networks. Q:Which type and size of pump is best for pumping water from a house tank up to holding tanks for gravity feed? I need to pump up the hill to a 15 metre head height over a distance of approximately 100 metres. Hi, it is difficult to advise exactly what pump you need without more information; e.g. what is the uplift from the tank to the pump, how much water you need to move, how quickly, whether the distance between the points is in a straight line, what size are your hoses etc. etc. However, as a rule of thumb, the maximum head capacity of the pump can tell you what the pump can do in terms of; suction height + uplift. For example, if you needed to draw up water 5 metres from the water source to the pump, then move the water from the pump up a gradient of 15 metres, then you would need a pump with a maximum head greater than 20 meters (5 +15). Also remember that there will be a small loss of head capacity through general friction, so your first consideration is a pump with head capacity greater than 20 metres, then secondly what flow rate (litres/min) you require - this is where the pump charts come in handy (on the product brochures) as the water flow rate diminishes with the height. Depending on your suction height, I would be inclined to look at a Honda or Subaru powered 2" or 3" Transfer Pump that has a head capacity of around 30-35 metres and flow rate of around 500-600 litres per minute. If your suction height or flow rate requirement is larger, then you'll need to look at a larger pump. Q:I need a transfer pump to move some water from a flood prone area of my property. How do I know what size pump I need? Hi - great question. There are many variables when transferring water (hose width, hose bending, how much pressure you may want/need, how much water you want to move per minute etc.). However, as a rule of thumb, the Maximum Head capacity of the pump will tell you what the pump can do in terms of; suction height + uplift. For example, if you needed to draw up water 4 metres from the water source to the pump, then move the water from the pump up a gradient of 25 metres, then you would need a pump with a maximum head greater than 29 meters (4 + 25). You should also consider how much water you want to move per minute and how much discharge pressure you may need, this is where pump charts come in handy as delivery capacity falls away as max head capacity is approached. The maximum head rating (in metres), and water flow rating (litres per minute) of the water pump is listed under the Specifications of each pump model. As mentioned, there are many variables when considering water transfer requirements and this rule can be used as a good approximate guide. We advise you use this rule and select a pump with greater max head capacity than your requirements to account for other small things such as friction which will also slightly reduce the pump's head capacity. Q:Based on my understanding of ‘Maximum Head’, would I be right in saying that a pump with a Max Head of say 20m, could transfer water 18m directly vertical, if the suction inlet was 2m above the water source? Yes. That is the correct interpretation of the Max Head capacity of a pump. Note in your theoretical example though, the water pressure and flow rate would be around zero at the discharge point (because the max head of the pump is 20 metres and the sum requirement of your example is also 20 metres). In practice, if you're pumping requirement totaled 20 metres, you would want to get a pump with a max head capacity of greater than 20 metres, to have sufficient water flow and account for small head loss from friction. Q:Do the pumps have varying settings to control water flow, or do they run at one speed? The engines that run the pumps have an engine throttle, which controls the engine speed and therefore in turn the pace at which the water is being pumped. But there is not a direct pump speed control. The exception to this within our range of pumps is the Honda 6” Water Master Transfer Pump model (MH60E), which comes with an automatic throttle. Q:When talking about the size of the pump, does that refer to the diameter of the inlet or the outlet? In our range of pumps, the inlet and outlet size of the pump is the same, with the exception of the Fire Fighting pump models. These high pressure Fire Fighting pump models will have one inlet and one transfer outlet the same size which classifies the size of the pump...then most Fire Fighting Pump models will also have two additional outlets which are slightly smaller and are designed for the high pressure discharge. Q:Hi, With the Water Master pumps, what materials are the actual pumps made out of? Thanks very much for your inquiry. In regards to the water master pump range the fire fighting and water transfer pumps are both made of cast aluminium; the trash pumps are made of cast iron. The standard chemical pump is made of plastic, and the stainless steel model is made of stainless steel. Q:Hi, I need to irrigate my garden approx 20m x 20m with a pump. I have a creek for a water source about 20-30 metres from my garden. Which type of pump is best for me? Thanks for your question Craig. Most any water pump would handle your application. It largely depends on how you plan to "water" your garden which will help you decide the best type of pump. If you are simply watering with a garden hose and no nozzle, then this water pump would do the job. Please note that the pump should be as close to the water source as possible and you should use a good quality suction hose as well as a quality strainer to prevent any debris from getting into the pump. If you intend to use a nozzle or a sprinkler for your your watering, then it may be worth considering a high pressure fire fighting pump as these pumps provide a higher pressure that would be needed to provide effective coverage and proper operation of the nozzle or sprinkler heads. Q:Hi, I’m looking for a pump to deliver water from a creek to a garden area about 400 meters apart; what do you recommend? Hi, our portable pump range (transfer pumps, fire fighting pumps, trash pumps, submersible pumps, chemical pumps) have models that will effectively handle pumping vertical distances from about 20 metres up to about a maximum of around 90 metres - this is the Maximum Head capacity rated on every pump's specifications. The Maximum Head rating will tell you the maximum height the pump can pump to. So you need to know how much height you will need to draw from the water source up to the pump (suction height) and how much height you will be moving the water (uplift). For example, if you needed to draw up water 5 metres from the water source to the pump, then move the water from the pump up a gradient of 25 metres, then you would need a pump with a maximum head greater than 30 meters (5 + 25). Also note that as water moves through the hosing and the bends it will encounter friction, causing some small additional head loss - so you should need to choose a pump with maximum head larger than your height pumping requirements. Then you'll need to consider what flow rate you want to move the water at...this is where Pump Charts are important to consider (see product brochure) because delivery capacity falls away as max head capacity is approached. Overall, work out your suction height + uplift, then choose a pump with max head capacity to more than handle the sum of those heights, and a pump that satisfies your flow rate requirements. Q:Can I use this pump for some chemical irrigation / spot spraying? Hi there - This pump is fitted with rubber seals as standard. However, viton seals can be fitted on request. Viton seals make the pump suitable to transfer diesel (noting that if you do regularly transfer diesel with this pump, that it is recommended the seals are replaced every 12-24 months)...so in relation to chemicals, it is difficult to advise as different chemicals would have varying impact on the seals; if you intend to use chemicals /chemical mix that would be harsher on the seals than diesel, then it would be better to consider a specialist Chemical Transfer pump. Otherwise if your chemical mix would be equal or milder than diesel in terms of impact on the pump's seals, then this model of pump would be suitable for your spraying requirements (with viton seals fitted). Hope that helps, thanks. Q:Can you transfer saltwater through a standard Transfer pump? Hi, a standard transfer pump is not designed to transfer salt water. We are aware of people that do use standard transfer pumps to move salt water, but if they are not flushed thoroughly with freshwater after use (which often they are not), then the seals will be damaged and corrosion is likely to occur. This damage would not be covered under warranty. You would need to look at a Chemical Pump which are built with stainless steel heads, fasteners and shafts, along with viton seals. These pumps are specifically designed for pumping waste water, chemicals, sea water, fertiliser and other caustic liquids. Q:Do the Water Master Pumps have screw-in (thread) fittings or camlock fittings? All the Water Master range are screw fittings (standard BSP Thread). You can get an additional separate fitting which allows camlock coupling connection.